No more scratching your head at malfunctioning appliances. With this guide, you'll learn the ins and outs of troubleshooting your home and household electronics using one of your toolkit's handiest instrument. Once reserved for engineers and electronic technicians, multimeters—sometimes called “multitesters”—have come down in price and size, making them indispensable for homeowners who have basic knowledge of circuitry. When troubleshooting problems with small appliances, smart-home modules, speaker systems, or just about any other electronic item, a multimeter will be among the most valued tools in your arsenal. If you’re new to multimeters, these gadgets may seem daunting at first. Learn the basics, however, and you’ll soon be able to perform a number of diagnostic tests on your own. Because multimeters vary from model to model, be sure to study your specific unit’s operating manual before you get started. Analog multimeters, or volt-ohm-milliammeters (VOM), have been around for decades and can still be found, affordably, at any do-it-yourself-type store. The new kids on the block—digital multimeters (DMM)—offer greater precision with decimal point readouts, even enhanced functions, such as the ability to auto-detect alternating current (AC) or direct current (DC). Both VOM and DMM models measure voltage, resistance, and current, replacing the need for individual voltmeters, ohmmeters, and ammeters. 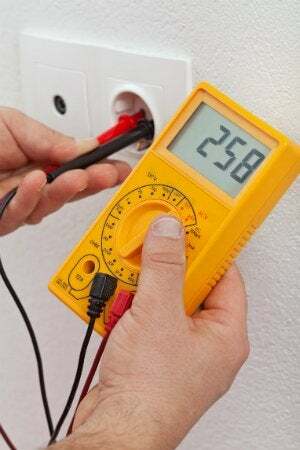 While you can test household voltage with a multimeter, electrical-current-testing is limited to low-voltage circuits, such as small direct current (DC) motors or low-voltage alternating current (AC) appliances—your thermostats and doorbells, for example. To avoid blowing a fuse, destroying the multimeter, or risking injury, do not attempt to test current higher than the maximum allowed for your unit. With a multimeter, you can measure both AC and DC voltage—particularly useful for locating short circuits or determining if a rechargeable battery is holding a charge. Start by selecting the corresponding current on the multimeter and a voltage range higher than the current you’re testing. For example, if you’re measuring the voltage in a 120-volt wall outlet, turn the multimeter knob to the next highest option—200 ACV. If you’re testing a 12-volt car battery, select the next highest option—20 DCV. Then make sure to connect your test leads to the proper jacks before testing: For voltage testing, plug the red lead in to the port labeled “V.” For this and all multimeter tests, the black lead plugs into the common (COM) port. To test a battery’s DC charge, touch the red probe to its positive terminal and the black probe to its negative terminal; the multimeter will display the existing charge in the battery. Since polarity isn’t an issue in AC voltage, it doesn’t matter which probe you insert in either hole of a wall outlet; insert both probes, and the multimeter will display the voltage at the outlet. Safety Tip: Hold probes by their insulated handles. Do not touch the metal part of the probes to avoid electrical shock. In electronics, “resistance,” is the amount of hindrance to the flow of electricity, and less is more—or, rather, good for the operation of your appliances. Multimeter in hand, you can test resistance in circuit board components and appliance elements throughout the house. If, for example, a microwave isn’t operating as it should, this checkup could help you you determine if you should replace a single non-functioning component on the circuit board or buy a new microwave outright. First, make sure the appliance is unplugged before testing. Plug the red lead into the port with the ohm’s symbol, “Ω,” and select the lowest ohms’ function on the dial. While you can test individual capacitors and components directly on a circuit board, you’ll get a more accurate reading if you remove a component and then test it. When you touch the black and red probes to both ends of a component, simultaneously, you’ll get a reading. The lower the reading, the less the resistance to electrical flow. By comparing the readings from other components on the circuit board, you can determine whether or not to replace a component with an unusually high reading. ”. A small reading—or a beep—indicates there is a continuous path between the two points. No reading or beep, however, indicates a problem. For example, if you’ve just put a new bulb in your lamp but it still doesn’t turn on, running this test at both ends of its power cord can confirm that an internally broken cord is to blame for your dim room. 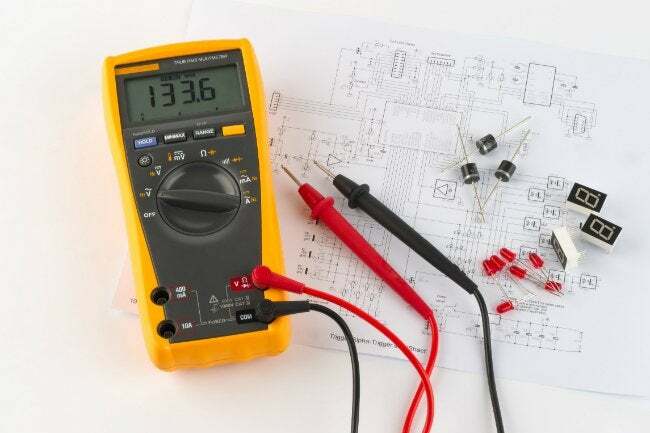 In order to measure low-voltage current, the multimeter must become part of the circuit, allowing the current to actually run through the multimeter. This is handy for determining whether a low-voltage circuit, such as a looped set of solar-powered landscape lights, is getting power to all the lights. For this test, plug the red lead into the port labeled, “A,” for Amps, and select the next-highest Amps function on the dial. Your operating manual may provide a chart, but if not, you can test a simple circuit by connecting the live feed from the power-supply (usually black) to the multimeter’s red probe. The multimeter’s black probe then connects to the positive wire (usually black) on the appliance you’re testing. Finally, the neutral power-supply lead (usually white) connects to negative appliance wire (also white). When you’ve hooked up the circuit correctly, turn on the power source to measure the electrical flow rate, or amps, through the circuit. Safety Tip: As previously mentioned, do not test a circuit that exceeds your multimeter’s capability. Multimeters are “fused” at a maximum amount of voltage, which is typically lower than household current. If a multimeter bears the words, “10A MAX FUSED,” do not test any current you suspect might be higher than 10 Amps.